It drove me crazy on my last road trip thinking about not having a spare tire with me. I bought a takeoff spare on craigslist, jack and lug wrench on amazon, and $20 in various hardware at Home Depot. An hour later, my trunk looks 100%, but my mind is at peace. Cut an 18" wood disc, drilled to bolt it to the stock 4 mount points, and 2 studs to hold the spare The spare sits toward the front of the car to make room for the jack at the back. If I ever have to change a tire, I will not be able to put the flat tire back into the spare tire well. It was a decision I made to be able to fit the jack under the floor. The stock foam sheet, and the red scissor jack tucked against the rear of the spare tire well, it gets held down by the tire. Spare tire held down with two wing nuts. Tools to the left, stock compressor and foam tucked into the spare just in case. Hardboard to provide a flat and sturdy trunk floor. Double thick in the middle over the wheel. and finally, a stock looking trunk. I hope I never have to see whats under that carpet again, but it makes me feel warm and fuzzy that it is there. Total investment was around $75. The snow brush lives in my trunk, I found one that matches Jalepeno Green perfectly (although my phone camera does not represent colors well). A good sunday morning, and a good rest of the life of my Spark! Outstanding addition to your spark. Great step by step process and very clear instructions. I agree with you about feeling better with the spare. Once again, great job. Did you check the diameter of the center hole? I thought I had mine all sorted until I checked the fit and found that the hole in the center of the wheel was smaller than the hub. Still need to fix this and put the donut back in the car. I like to way you did everything, think I'm going to have to do something similar once the weather warms up again. Thank you guys for the compliments. I put the spare on the car to double check it before doing all the work. Looks really good. What car did the Donut come out of ? And did not have to make the center hole bigger? Wonder if any are on ebay? Came off an old honda, don't know which one for sure. I went armed with a pair of calipers to check the center bore. Find a spare tire on sale, check the bolt pattern/center bore for that car on any of a number of aftermarket wheel sites. Yes, my stock wheel fits. But I understand some of the earlier models of Spark have a smaller wheel well and stock wheels will not fit. I've tried twice now and can never seem to get my stock wheels in that spot. Maybe if all the air was out, but at 40psi it is just slightly too big to fit in my car for whatever reason. If it fit, I'd have a full size spare stored. My only concern would be the age of the donut spare. They are only rated for 10 years or so. Obviously, they are not exposed to any UV rays spending their life in the trunk, but they do dry out. You can buy new ones on TR. Tirerack. I stumbled across the new spare tires one day. 3 years later, totally worth it to do this work. Friday night, 11pm in the rain. I hit a pothole that bent a wheel and cut a tire. Spare had me on the road in 15 minutes, vs the convenience kit that would have had me waiting for hours for a tow. This little project paid for itself ten fold! I got my spare out of a chevy aveo $100bucks shipped for the whole kit. fits like a glove on the front and back of the car, and surprisingly the lug wrench fit too. i just had to cut a few corners of the foam insert that goes over the inflator kit that came with the car. What size is the donut did you all use or are they all the same size? I replaced the (now used) donut spare with a 175/65R14 tire mounted on the spare rim. Far from ideal, but if it saves me just once ever again, well worth it. New spare tires are 150-250+ depending on the size. My replacement tire is a sketchy chinese knockoff of a chinese tire, but was only $30. It fit in the spare well (early 2013 build), but now my jack has to live in the trunk space. Great diy. 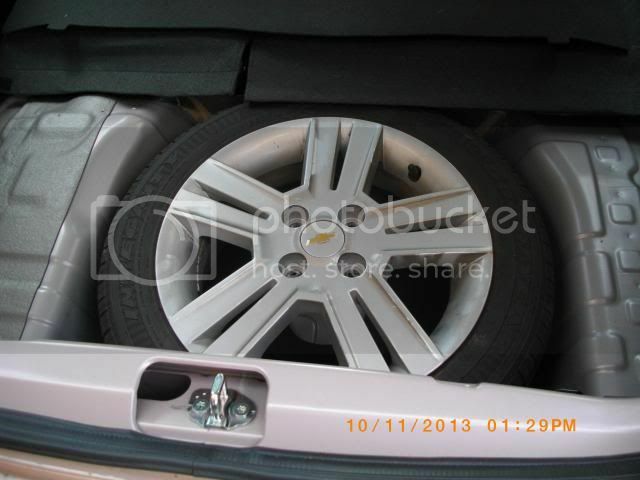 I am only surprised with a fact that in US GM is not providing spare wheel. My Beat does have a spare perfect fitting in wheel well, plus it have a big plastic wing nut which hold it. On top a foam based organizer is there which holds jack, screwdriver and small parts. Well, we are not required by law to have a spare tire in the car, so gm gives us a tire inflator with a can of sealant attached which costs a fraction of the price of a full spare. Here I am not sure about laws but due to road conditions, its becomes a necessity. What year is your Spark (Chevy Beat) and how is it holding up in the conditions in India?..Any issues you have had? Its 2010 and it good car for roads here. Its small, its powerful, good for city n Highway drive. Only the thing is tyre are purposely kept small 155/70 R14 to manage the kpl. I am using this for past two years and find no major issue. I am 2nd owner so got some clutch issue inherited.